Gorgeous. Absolutely gorgeous. That’s how I would describe this day. You might remember my pitiful posts from a few weeks ago, trapped inside without electricity or sunshine. Well, today is different – MUCH different. The sun is out and showing all its glory against the pale blue cotton sky. Even the birds seem to find cause for chorus this afternoon. 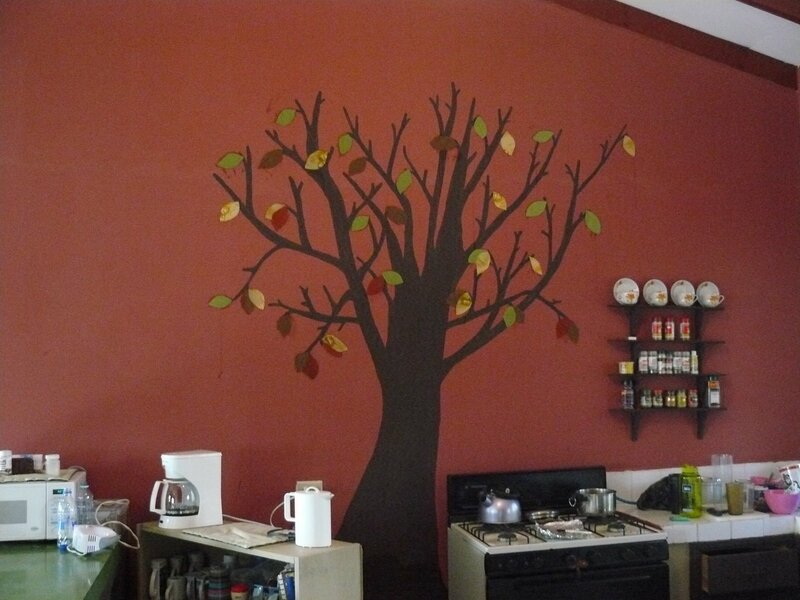 I finally finished the painting project in the kitchen. Actually, it had more to do with starch and fabric than paint. I saw this idea Christina used in her living room and decided I would try a variation here. I am so glad to say it worked and we love it! The seasons aren’t here quite the same as Iowa, so a daily reminder of changing leaves is refreshing. Well, well. This week has flown by almost as fast as the motorcycles at the gate. I’m pushing through these last few weeks with a new teaching approach, refreshed perspective for purpose, and daily in wonder at the gift of life. I’m following John Piper’s sermons via video each week and as we make our way through John, my heart is full of gratitude. Not so ironically, at the same time I am studying Beth Moore’s, “Jesus the One and Only” devotional. I’m getting to know Jesus – the person. How strange to think that Jesus wandered around as a child, questioned adults about things as a young man, and watched his siblings fight. I am gearing up for this week and I’m excited to see what the Lord will do. Here’s a bit of what might show up on the blog. So, a very long time ago I was going to write about something that happened at the fall party. Now, I’ve waited long enough to just make it a double and write about the Christmas party we had on Saturday as well. Even though I’m not shivering in below zero temperatures, I still see all the crazy “Christmas” holiday decorations, advertisements, and ridiculous light displays. There’s even a Santa train that goes up and down the boulevard. How is Christmas about the giving? So, our family has a lot of traditions at Christmas. Watching a few movies is usually one of them. Christina’s favorite is — well, I’ll just let you read about that this week! I’m doing a unit (believe it or not it’s IN the textbook!) on critical thinking and problem-solving. I’m trying to get them to make connections with real-life… instead of always relating things at school to school, I want them to open up about how we daily have problems that need solving… especially in our relationship with God. Who knows what this will be!! This Christmas is difficult in weird ways. Actually, we’re trying really hard to make it feel like Christmas, without cold and snow and family. I think we’re doing a pretty good job, but I can tell you I am eager to step off that plane in Omaha to greet a couple bound for a little farm in southwest Iowa. This entry was posted in creativity, Lineup. Previous Post Previous post: New Honduran Horizon! Next Post Next post: Parties are Exhausting!